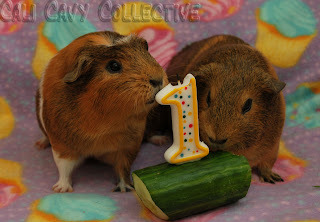 Cali Cavy Collective: a blog about all things guinea pig: Belka and Truffle turn one! Belka and Truffle turn one! Belka and Truffle turn one this month! Of course, nobody knows their actual birthday, but our humans estimated that it is sometime in July. Belka and Truffle are sisters from the same litter. Judging by Truffle's size, which is a lot smaller than Belka, whee guessed that she is the younger of the two. However, you certainly wouldn't be able to tell by her attitude - although she's the smallest, she makes up for it with her bite. Often, just a glare from her is enough to send the much larger Peaches and Belka running for cover. Or downstairs, whichever is closer. But whee digress. Anyways, Belka and Truffle got to have their own special piggy party with lots of wheatgrass and the wearing of celebratory headgear! 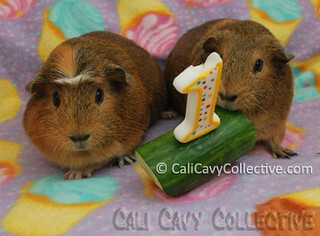 Happy first birthday Belka and Truffle! "...but this is a satisfactory consolation prize."